Ship breaking or ship demolition is a type of ship disposal involving the breaking up of ships for either a source of parts, which can be sold for re-use, or for the extraction of raw materials, chiefly scrap. It may also be known as ship dismantling, ship cracking, or ship recycling. Modern ships have a lifespan of 25 to 30 years before corrosion, metal fatigue and a lack of parts render them uneconomical to run. Ship breaking allows the materials from the ship, especially steel, to be recycled and made into new products. This lowers the demand for mined iron ore and reduces energy use in the steelmaking process. Equipment on board the vessel can also be reused. While ship breaking is sustainable, there are concerns about the use of poorer countries without stringent environmental legislation. It is also considered one of the world's most dangerous industries and very labour-intensive. In 2012, roughly 1,250 ocean ships were broken down, and their average age was 26 years. In 2013, the world total of demolished ships amounted to 29,052,000 tonnes, 92% of which were demolished in Asia. India, Bangladesh, China and Pakistan have the highest market share and are global centres of ship breaking, with Chittagong Ship Breaking Yard in Bangladesh, Alang in India and Gadani in Pakistan being the largest ships' graveyards in the world. The largest sources of ships are states of China, Greece and Germany respectively, although there is a greater variation in the source of carriers versus their disposal. The ship breaking yards of India, Bangladesh, China and Pakistan employ 225,000 workers as well as providing a large number of indirect jobs. In Bangladesh, the recycled steel covers 20% of the country's needs and in India it is almost 10%. As an alternative to ship breaking, ships may be sunk to create artificial reefs after legally-mandated removal of hazardous materials, or sunk in deep ocean waters. Storage is a viable temporary option, whether on land or afloat, though all ships will be eventually scrapped, sunk, or preserved for museums. Wooden-hulled ships were simply set on fire or 'conveniently sunk'. In Tudor times, ships were also dismantled and the timber re-used. This procedure was no longer applicable with the advent of metal-hulled boats. HMS Queen heeled over on the Thames foreshore off Rotherhithe. The navy vessel HMS Temeraire had her masts, stores and guns removed and her crew paid off. She was sold by Dutch auction on 16 August 1838 to John Beatson, a shipbreaker based at Rotherhithe for £5,530. Beatson was then faced with the task of transporting the ship 55 miles (89 km) from Sheerness to Rotherhithe, the largest ship to have attempted this voyage. To accomplish this he hired two steam tugs from the Thames Steam Towing Company and employed a Rotherhithe pilot named William Scott and twenty five men to sail her up the Thames, at a cost of £58. The shipbreakers undertook a thorough dismantling, removing all the copper sheathing, rudder pintles and gudgeons, copper bolts, nails and other fastenings to be sold back to the Admiralty. The timber was mostly sold to house builders and shipyard owners, though some was retained for working into specialist commemorative furniture. The ship's final voyage was immortalised by William Turner's painting The Fighting ‘Temeraire’, Tugged to her Last Berth to be Broken Up, 1838. In 1880, Denny Brothers of Dumbarton used scrap maritime steel in their shipbuilding. Many other nations began to purchase British ships for scrap by the late 19th century, including Germany, Italy, the Netherlands and Japan. The Italian industry started in 1892, and the Japanese after an 1896 law had been passed to subsidise native shipbuilding. After being damaged or involved in a disaster, liner operators did not want the name of the broken ship to tarnish the brand of their passenger services. The final voyage of many Victorian ships was with the final letter of their name chipped off. In the 1930s, it became cheaper to 'beach' a boat and run her ashore as opposed to using a dry dock. The ship would have to weigh as little as possible and run ashore at full speed. Dismantling operations required a 10 feet (3.0 m) rise of tide and close proximity to a steel-works. Electric shears, a wrecking ball and oxy-acetylene torches were used. The technique of the time is almost identical to that of developing countries today. Similarly, Thos W Ward Ltd., one of the largest breakers in the United Kingdom in the 1930s, would recondition and sell all furniture and machinery. Many historical artifacts were sold at public auctions: the Cunarder Mauretania received high bids for her fittings worldwide. However, even with obsolete technology, any weapons and military information were carefully removed. Until the late 20th century, ship breaking took place in port cities of industrialized countries such as the United Kingdom and the United States. Those dismantlers that still remain in the United States work primarily on government surplus vessels. In the mid 20th century, low-cost East Asian countries began to dominate ship breaking, with countries such as Japan, then Korea and Taiwan and then China increasing their world share. For example, in 1977 Taiwan dominated the industry with more than half the market share, followed by Spain and Pakistan. Bangladesh had no capacity at all. However, the sector is volatile and fluctuates wildly, and Taiwan processed just 2 ships 13 years later as wages across East Asia rose. In 1960, after a severe cyclone, the Greek ship M D Alpine was stranded on the shores of Sitakunda, Chittagong. It could not be re-floated and so remained there for several years. In 1965, the then in East Pakistan, Chittagong Steel House bought the ship and had it scrapped. It took years to scrap the vessel, but the work gave birth to the industry in Bangladesh. 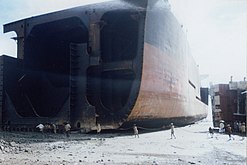 Until 1980 the Gadani ship-breaking yard of Pakistan was the largest ship-breaking yard in the world. Tightening environmental regulations resulted in increased costs of hazardous waste disposal in industrialised countries in the 1980s, causing ships to be exported to lower income nations, chiefly South Asia. This, in turn, created a far worse environmental problem, subsequently leading to the Basel Convention. In 2004 a Basel Convention decision officially classified old ships as “toxic waste”, preventing them from leaving a country without the permission of the importing state. This has led to a resurgence of recycling in environmentally-compliant locations in developed countries, especially in former ship building yards. On 31 December 2005, the French Navy's Clemenceau left Toulon to be dismantled in Alang, India despite protests over improper disposal capabilities and facilities for the toxic wastes. On 6 January 2006 the Supreme Court of India temporarily denied access to Alang, and the Conseil d'État ordered Clemenceau to return to French waters. Able UK in Hartlepool received a new disassembly contract to use accepted practices in scrapping the ship. The dismantling started on 18 November 2009 and the break-up was completed by the end of 2010, and the event was considered a turning point in the treatment of redundant vessels. Europe and the United States have actually had a resurgence in ship scrapping since the 1990s. In 2009 the Bangladesh Environmental Lawyers Association won a legal case prohibiting all substandard ship breaking. For 14 months the industry could not import ships and thousands of jobs were lost before the ban was annulled. That same year, the global recession and lower demand for goods led to an increase in the supply of ships for decommissioning. The rate of scrapping is inversely correlated to the freight price, which collapsed in 2009. The decommissioning process is entirely different in developed countries than it is in developing countries. Both start with an auction for which the highest bidder wins the contract. The ship-breaker then acquires the vessel from the international broker who deals in outdated ships. The price paid is around $400 per tonne and the poorer the environmental legislation the higher the price. The purchase of water-craft makes up 69% of the income earned by the industry in Bangladesh, versus 2% for labour costs. The boat is taken to the decommissioning location either under its own power or with the use of tugs. In developing countries, chiefly the Indian subcontinent, ships are run ashore on gently sloping sand tidal beaches at high tide so that they can be accessed for disassembly. As described in "History" (above), the sizeable ship breaking industry of Bangladesh traces its origin to a ship beached there accidentally during a cyclone. Manoeuvring a large ship onto a beach at high speed takes skill and daring even for a specialist captain, and is not always successful. Next, the anchor is dropped to steady the ship and the engine is shut down. It takes 50 labourers about three months to break down a normal-sized cargo vessel of about 40,000 tonnes. The decommissioning begins with the draining of fuel and firefighting liquid, which is sold to the trade. Any re-usable items—wiring, furniture and machinery—are sent to local markets or the trade. Unwanted materials become inputs to their relevant waste streams. Often, in less-developed nations, these industries are no better than ship breaking. For example, the toxic insulation is usually burnt off copper wire to access the metal. Some crude safety precautions exist—chickens are lowered into the chambers of the ship, and if the birds return alive, they are considered safe. Sledgehammers and oxy-acetylene gas-torches are used to cut up the steel hull. Cranes are not typically used on the ship, because of costs. Pieces of the hull simply fall off and are dragged up on the beach, possibly aided with a winch or bulldozer. These are then cut into smaller pieces away from the coast. 90% of the steel is re-rollable scrap: higher quality steel plates that are heated and reused as reinforcement bar for construction. The remainder is transported to electric arc furnaces to be melted down into ingots for re-rolling mills. In the re-rolling mills, the heating of painted steel plates (in particular, those painted with chlorinated rubber paints) generates dioxins. Substances which are costly to dispose of, such as hazardous waste, are left on the beach or set on fire, even old batteries and half-empty cans of paint. Stockpiled in Bangladesh, for example, are 79,000 tonnes of asbestos, 240,000 tonnes of PCBs and 210,000 tonnes of ozone-depleting substances (mainly chlorinated polyurethane foam). In developed countries the dismantling process should mirror the technical guidelines for the environmentally sound management of the full and partial dismantling of ships, published by the Basel Convention in 2003. Recycling rates of 98% can be achieved in these facilities. Prior to dismantling, an inventory of dangerous substances should be compiled. All hazardous materials and liquids, such as bilge water, are removed before ship breaking. Holes should be bored for ventilation and all flammable vapours are extracted. Vessels are initially taken to a dry dock or a pier, although a dry dock is considered more environmentally friendly because all spillage is contained and can easily be cleaned up. Floating is, however, cheaper than a dry dock. Storm water discharge facilities will stop an overflow of toxic liquid into the waterways. The carrier is then secured to ensure its stability. Often the propeller is removed beforehand to allow the water-craft to be moved into shallower water. Workers must completely strip the ship down to a bare hull, with objects cut free using saws, grinders, abrasive cutting wheels, hand held shears, plasma and gas torches. Anything of value, such as spare parts and electronic equipment is sold for re-use, although labour costs mean that low value items are not economical to sell. The Basel Convention demands that all yards separate hazardous and non-hazardous waste and have appropriate storage units, and this must be done before the hull is cut up. Asbestos, found in the engine room, is isolated and stored in custom-made plastic wrapping prior to being placed in secure steel containers, which are then landfilled. Many hazardous wastes can be recycled into new products. Examples include lead-acid batteries or electronic circuit boards. Another commonly used treatment is cement-based solidification and stabilization. Cement kilns are used because they can treat a range of hazardous wastes by improving physical characteristics and decreasing the toxicity and transmission of contaminants. A hazardous waste may also be "destroyed" by incinerating it at a high temperature; flammable wastes can sometimes be burned as energy sources. Some hazardous waste types may be eliminated using pyrolysis in a high temperature electrical arc, in inert conditions to avoid combustion. This treatment method may be preferable to high temperature incineration in some circumstances such as in the destruction of concentrated organic waste types, including PCBs, pesticides and other persistent organic pollutants. Dangerous chemicals can also be permanently stored in landfills as long as leaching is prevented. Valuable metals, such as copper in electric cable, that are mixed with other materials may be recovered by the use of shredders and separators in the same fashion as e-waste recycling. The shredders cut the electronics into metallic and non-metallic pieces. Metals are extracted using magnetic separators, air flotation separator columns, shaker tables or eddy currents. The plastic almost always contains regulated hazardous waste (e.g., asbestos, PCBs, hydrocarbons) and cannot be melted down. Large objects, such as engine parts, are extracted and sold as they become accessible. The hull is cut into 300 tonne sections, starting with the upper deck and working slowly downwards. While oxy-acetylene gas-torches are most commonly used, detonation charges can quickly remove large sections of the hull. These sections are transported to an electric arc furnace to be melted down into new ferrous products, though toxic paint must be stripped prior to heating. 70% of ships are simply run ashore in developing countries for disassembly, where (particularly in older vessels) asbestos, lead, polychlorinated biphenyls and heavy metals pose a danger for the workers. Burns from explosions and fire, suffocation, mutilation from falling metal, cancer, and disease from toxins are regular occurrences in the industry. Asbestos was used heavily in ship construction until it was finally banned in most of the developed world in the mid-1980s. Currently, the costs associated with removing asbestos, along with the potentially expensive insurance and health risks, have meant that ship breaking in most developed countries is no longer economically viable. Dangerous vapors and fumes from burning materials can be inhaled, and dusty asbestos-laden areas are commonplace. Removing the metal for scrap can potentially cost more than the value of the scrap metal itself. In the developing world, however, shipyards can operate without the risk of personal injury lawsuits or workers' health claims, meaning many of these shipyards may operate with high health risks. Protective equipment is sometimes absent or inadequate. The sandy beaches cannot sufficiently support the heavy equipment, which is thus prone to collapse. Many are injured from explosions when flammable gas is not removed from fuel tanks. In Bangladesh, a local watchdog group claims that one worker dies a week and one is injured per a day on average. The problem is caused by negligence from national governments, shipyard operators, and former ship owners disregarding the Basel Convention. According to the Institute for Global Labour and Human Rights, workers who attempt to unionize are fired and then blacklisted. The employees have no formal contract or any rights, and sleep in over-crowded hostels. The authorities produce no comprehensive injury statistics, so the problem is underestimated. Child labour is also widespread: 20% of Bangladesh's ship breaking workforce are below 15 years of age, mainly involving in cutting with gas torches. There is, however, an active ship breaker's union in Mumbai, India (Mumbai Port Trust Dock and General Employees’ Union) since 2003 with 15,000 members, which strikes to ensure fatality compensation. It has set up a sister branch in Alang, gaining paid holidays and safety equipment for workers since 2005. They hope to expand all along the South Asian coastline. Several United Nations committees are increasing their coverage of ship breakers' human rights. In 2006, the International Maritime Organisation developed legally binding global legislation which concerns vessel design, vessel recycling and the enforcement of regulation thereof and a 'Green Passport' scheme. Water-craft must have an inventory of hazardous material before they are scrapped, and the facilities must meet health & safety requirements. The International Labour Organization created a voluntary set of guidelines for occupational safety in 2003. Nevertheless, Greenpeace found that even pre-existing mandatory regulation has had little noticeable effect for labourers, due to government corruption, yard owner secrecy and a lack of interest from countries who prioritise economic growth. To safeguard worker health, the report recommends that developed countries create a fund to support their families, certify carriers as 'gas-free' (i.e. safe for cutting) and to remove toxic materials in appropriate facilities before export. To supplement the international treaties, organisations such as the NGO Shipbreaking Platform, the Institute for Global Labour and Human Rights and ToxicsWatch Alliance are lobbying for improvements in the industry. There are also guards who look out for any reporters. In recent years, ship breaking has become an issue of environmental concern beyond the health of the yard workers. Many ship breaking yards operate in developing nations with lax or no environmental law, enabling large quantities of highly toxic materials to escape into the general environment and causing serious health problems among ship breakers, the local population, and wildlife. Environmental campaign groups such as Greenpeace have made the issue a high priority for their activities. Along the Indian subcontinent, ecologically-important mangrove forests, a valuable source of protection from tropical storms and monsoons, have been cut down to provide space for water-craft disassembly. In Bangladesh, for example, 40,000 mangrove trees were illegally chopped down in 2009. The World Bank has found that the country's beaching locations are now at risk from sea level rise. 21 fish and crustacean species have been wiped out in the country as a result of the industry as well. Lead, organotins such as tributyltin in anti-fouling paints, polychlorinated organic compounds, by-products of combustion such as polycyclic aromatic hydrocarbons, dioxins and furans are found in ships and pose a great danger to the environment. The Basel Convention on the Control of Trans-boundary Movements of Hazardous Wastes and Their Disposal of 1989 has been ratified by 166 countries, including India and Bangladesh, and in 2004, End of Life Ships were subjected to its regulations. It aims to stop the transportation of dangerous substances to less developed countries and mandate the use of regulated facilities. However, Greenpeace reports that neither vessel exporter nor breaking countries are adhering to its policies. The organisation recommends that all parties enforce the Basel Convention in full, and hold those who break it liable. Furthermore, the decision to scrap a ship is often made in international waters, where the convention has no jurisdiction. The Hong Kong Convention is a compromise. It allows ships to be exported for recycling, as long as various stipulations are met: All water-craft must have an inventory and every shipyard needs to publish a recycling plan to protect the environment. The Hong Kong Convention was adopted in 2009 but with few countries signing the agreement. In March 2012 the European Commission proposed tougher regulations to ensure all parties take responsibility. Under these rules, if a vessel has a European flag, it must be disposed of in a shipyard on an EU "green list." The facilities would have to show that they are compliant, and it would be regulated internationally in order to bypass corrupt local authorities. However, there is evidence of ship owners changing the flag to evade the regulations. China's scrap industry has vehemently protested against the proposed European regulations. Although Chinese recycling businesses are less damaging than their South Asian counterparts, European and American ship breakers comply with far more stringent legislation. ^ "Life Cycle of a Ship | shippipedia". www.shippipedia.com. Retrieved 2 August 2015. ^ Lord, Ross; Logan, Nick (12 September 2013). "Ship breaking: Newfoundland's legacy with one of the most hazardous jobs". globalnews.ca. Shaw Media Inc. Retrieved 4 August 2015. ^ a b c d "NGO Shipbreaking Platform » Problems and Solutions". www.shipbreakingplatform.org. NGO Shipbreaking Platform. Retrieved 2 August 2015. ^ a b c d "Technical guidelines for the environmentally sound management of the full and partial dismantling of ships" (PDF). Basel Convention series/SBC. ISSN 1020-8364. Retrieved 3 August 2015. ^ Miroux, Anne (20 November 2014). "Review of Maritime Transport 2014" (PDF). unctad.org. United Nations Conference on trade and development. Retrieved 2 August 2015. ^ Ashkar, Hisham H. (4 June 2015). "Shipbreaking in 2014 | GRID-Arendal – Maps & Graphics library". www.grida.no. GRID-Arendal. Retrieved 2 August 2015. ^ Rekacewicz, Philippe (25 February 2012). "Shipbreaking in Asia | GRID-Arendal – Maps & Graphics library". www.grida.no. GRID-Arendal. Retrieved 2 August 2015. ^ Smith, Gordon (1930s). "Ship breaking Industry". www.naval-history.net. Retrieved 3 August 2015. ^ a b c d Goodwin. The Ships of Trafalgar. p. 45. ^ "Temeraire". www.castlesshipbreaking.co.uk. Castles Shipbreaking. 2006. Retrieved 3 August 2015. ^ a b Willis. The Fighting Temeraire. p. 257. ^ a b c Smith, Gordon (2 August 2011). "Ship breaking Industry". www.naval-history.net. Retrieved 4 August 2015. ^ a b c d e Sarraf, Maria (Dec 2010). "SHIP BREAKING AND RECYCLING INDUSTRY IN BANGLADESH AND PAKISTAN" (PDF). siteresources.worldbank.org. International Bank for Reconstruction and Development / World Bank. Retrieved 3 August 2015. ^ a b c d Rane, Prathamesh V. (17 July 2014). "Echoes of Ship Breaking". www.youtube.com. Vega Productions. Retrieved 4 August 2015. ^ Heberlein, Claudia (November 2006). "Vital Waste Graphics 2" (PDF). www.grida.no. The Basel Convention Secretariat. p. 31. Retrieved 1 August 2015. ^ "AMERICAN SHIP BREAKING IT ALL COMES APART AT THE BOTTOM OF AMERICA". www.clui.org. The Center for Land Use Interpretation. Spring 2010. Retrieved 3 August 2015. ^ Zubair Ahmed (6 January 2006). "Stay out, India tells toxic ship". BBC News. Retrieved 5 March 2009. ^ "Chirac orders 'toxic' ship home". BBC News. 16 January 2006. Retrieved 5 March 2009. ^ "Ghost ship arrives in north-east". BBC News. 8 February 2009. Retrieved 5 March 2009. ^ Pike, John. "Shipyards". www.globalsecurity.org. Retrieved 3 August 2015. ^ "Ship breaking in Bangladesh: Hard to break up". The Economist. 27 October 2012. ISSN 0013-0613. Retrieved 3 August 2015. ^ Ravichandran, K. (September 2012). "Ship Breaking Industry: Key Trends and Credit Implications" (PDF). www.moneycontrol.com. ICRA Limited, An Associate of Moody's Investors Service. Retrieved 3 August 2015. ^ a b Chanev, Chavdar (31 July 2015). "Ship Breaking". www.shipcruise.org. Ship Cruise. Retrieved 3 August 2015. ^ a b c Gwin, Peter (May 2014). "The Ship-Breakers". ngm.nationalgeographic.com. National Geographic Society. Retrieved 3 August 2015. ^ a b c d Hülsen, Isabell; Wagner, Wieland; Zand, Bernhard (14 February 2013). "Booming Scrap Business: Ship-Breaking Lessons from the Exxon Valdez". Spiegel Online. Retrieved 3 August 2015. ^ a b c "The Graveyard of Giants: A history of ship breaking in Bangladesh". recyclingships.blogspot.co.uk. Unofficial Networks LLC. 28 February 2012. Retrieved 4 August 2015. ^ DASGUPTA, SOUMYAJIT (1 May 2013). "How Ship Dismantling is Done?". www.marineinsight.com. MarineInsight. Retrieved 3 August 2015. ^ a b c "Able UK's TERRC yard on Teesside". BBC. 23 November 2010. Retrieved 3 August 2015. ^ a b c d e f Pike, John. "Shipbreaking". www.globalsecurity.org. GlobalSecurity.org. Retrieved 3 August 2015. ^ "FedCenter – Hazardous Waste Landfills". ^ Vidal, John (5 May 2012). Bangladeshi workers risk lives in shipbreaking yards. The Guardian. Retrieved 16 March 2014. ^ a b c d e Schuiling, Jacqueline (December 2005). "END OF LIFE SHIPS THE HUMAN COST OF BREAKING SHIPS" (PDF). www.shipbreakingplatform.org. Greenpeace International & FIDH IN COOPERATION WITH YPSA. Retrieved 3 August 2015. ^ Where Ships and Workers Go to Die. Institute for Global Labour and Human Rights via YouTube. Retrieved 21 August 2018. ^ Belhassen, Souhayr (June 2008). "Child Labour in the Ship Recycling Industry in Bangladesh Childbreaking Yards" (PDF). www.shipbreakingplatform.org. International Platform on Shipbreaking, FIDH, YSPA. Retrieved 3 August 2015. ^ Rane, Prathamesh (24 January 2013). "NGO Shipbreaking Platform » Video: The Wire Nest…life In Mumbai's Shipbreaking Yards". www.shipbreakingplatform.org. Vega Productions. Retrieved 3 August 2015. ^ Haugen, Eivind (13 March 2006). "Ship recycling: The IMO develops a new legally binding instrument". www.dnv.no. DNV Corporate Communications. Retrieved 3 August 2015. ^ "Adopted on 1 December 2005 (Agenda item 11) NEW LEGALLY BINDING INSTRUMENT ON SHIP RECYCLING" (PDF). imo.org. INTERNATIONAL MARITIME ORGANIZATION. 6 February 2006. Retrieved 3 August 2015. ^ Murder in the Shipbreaking Yards. Institute for Global Labour and Human Rights, 2 December 2015. ^ "COMMENT OF TOXICSWATCH ALLIANCE (TWA) ON "CHANGES PROPOSED IN THE SHIP BREAKING CODE 2013". ^ "Accidents And Asbestos: Concerns Plaguing The Shipbreaking Industry In Developing Countries". mintpress.net. 2012-11-12. Retrieved 4 May 2015. ^ Gioia, Rosalinda; Eckhardt, Sabine; Breivik, Knut; Jaward, Foday; Prieto, Ailette; Nizzeto, Luca; Jones, Kevin C. (January 2011). "Evidence for Major Emissions of PCBs in the West African Region". Environmental Science & Technology. 45 (4): 1349–1355. doi:10.1021/es1025239. PMID 21226526. ^ "End of Life: The Human Cost of Breaking Ships". Greenpeace. 12 December 2005. Retrieved 16 March 2014. ^ "NGO Shipbreaking Platform » Why ships are toxic". www.shipbreakingplatform.org. NGO Shipbreaking Platform. May 2014. Retrieved 3 August 2015. ^ "Off the beach". www.offthebeach.org. NGO Shipbreaking Platform. 17 December 2012. Retrieved 3 August 2015. ^ Boonzaier, Johnothan (27 February 2013). "NGO Shipbreaking Platform » Tradewinds – Galloo Gent joins green-recycling body". www.shipbreakingplatform.org. NGO Shipbreaking Platform. Retrieved 4 August 2015. Langewiesche, William (2004). The Outlaw Sea: Chaos and Crime on the World's Oceans. London: Granta Books. ISBN 0-86547-581-4. Contains an extensive section on the shipbreaking industry in India and Bangladesh. Buxton, Ian L. (1992). Metal Industries: shipbreaking at Rosyth and Charlestown. World Ship Society. p. 104. OCLC 28508051. Ships scrapped include Mauretania and much of the German Fleet at Scapa Flow. Ships listed with owners and dates sold. Buerk, Roland (2006). Breaking Ships: How supertankers and cargo ships are dismantled on the shores of Bangladesh. Chamberlain brothers. p. 192. ISBN 1-59609-036-7. Breaking Ships follows the demise of the Asian Tiger, a ship destroyed at one of the twenty ship-breaking yards along the beaches of Chittagong. BBC Bangladesh correspondent Roland Buerk takes us through the process-from beaching the vessel to its final dissemination, from wealthy shipyard owners to poverty-stricken ship cutters, and from the economic benefits for Bangladesh to the pollution of its once pristine beaches and shorelines. Bailey, Paul J. (2000). "Is there a decent way to break up ships?". Sectoral Activities Programme. International Labour Organization. Retrieved 29 May 2007. Rousmaniere, Peter (2007). "Shipbreaking in the Developing World: Problems and Prospects". International Journal of Occupational and Environmental Health. Analysis of the economics of shipbreaking, the status of worldwide reform efforts, and occupational health and safety of shipbreaking including results of interviewing Alang shipbreakers. Siddiquee, N.A. 2004. Impact of ship breaking on marine fish diversity of the Bay of Bengal.DFID SUFER Project, Dhaka, Bangladesh. 46 pp. The Ship-Breakers at National Geographic.